Guide extraordinaire Dave Hahn may be a global mountaineering nomad, but it’s New Mexico that he calls home. The marquee peaks and climbs in the state vary in difficulty, but all demand cautious preparation. At the very least, every individual should pack plenty of water and a few layers of clothing, as the weather up high changes quickly. It’s always prudent to check conditions on the roads and trails before your hike, and to check with rangers before your adventure. Many of the trails require usage fees. In the summer, fast-moving thunderstorms should be on your radar. After celebrating your accomplishment, minimize time on the summit to avoid exposure. A rewarding hike despite the short distance, the trail to the top of Capulín affords significant vistas of northeast New Mexico. The trail starts just 2 mi . from the Capulín Volcano National Monument visitor center on the park access road located off N.M. 325, 3 m. N. of the town of Capulín, 35 mi. E. of Ratón. The hike is a simple loop from the trailhead. Not far from Taos Ski Valley (TSV), New Mexico’s tallest mountain is a very doable day hike. Park just past the TSV main parking lot near the Twining campground. Head NE toward the Bull-of-the-Woods Pasture boundary, and continue until you hit the Gold Hill Trail. Continue SE on the trail toward Bull-of-the-Woods Mountain. Don’t be fooled by Mount Walter, which gives you the impression you’ve already reached the summit of Wheeler Peak. The peak is a little bit farther. Not exactly a secret, this approach up the Sandías makes for a crowded but convenient training trip. The trail has a wide cut, so the steep climb up to the top of the Sandía Crest feels a little easier. Take Tramway Rd. off I-25 to Forest Rd. 333. The trailhead is past the Juan Tabo picnic grounds. Follow the markers for Trail 137. The La Luz Trail finishes at the Sandia Peak Tramway, providing a scenic way down if you parked at the base of the tram. Manzano Peak is the wild crown of the Manzano Range. Here hikers may encounter cougars, bears, and Rocky Mountain bighorn sheep. From N.M. 55 running north of Mountainair, take N.M. 131 to Forest Road 253, and then take Forest Road 422. Park at the junction of Forest Road 422 and Forest Road 275. Take Trail 80 to its junction with Trail 170, which climbs to the summit. A solitary peak along central New Mexico’s I-40 corridor, Mount Taylor commands impressive views of the region. The ascent, however, is relatively short and readily accessible from Grants. N.M. 547 leads to the mountain from the center of town, and Forest Road 193 picks up at the end of the pavement. 193 bears right on a dirt road for five miles before the trailhead. Follow the signs for Trail 77, and take it to the summit. The final stretch of the climb is steep and challenging. Alternatively, adventure athletes can wait until winter for the Mount Taylor Quadrathlon and run, bike, ski, or snowshoe to the top. In October, a 50K run to the top shows off the fall colors. The Santa Fe Baldy approach begins on the famed Winsor Trail near the bottom of the Santa Fe Ski Basin. The first half-mile climbs sharply to the fenced border of the Pecos Wilderness, and then the trail levels out for the next several miles. The Winsor Trail eventually meets Trail 251 heading N., and leads to the top of Santa Fe Baldy. Toward the summit, hikers should be very aware of conditions. Baldy is named so for a good reason—the last section of the hike offers little protection from the elements. Dave Hahn does not stop moving. On the trail, his penchant for perpetual motion makes him an inspiration to his mountaineering teammates and the clients he guides on the world’s toughest terrain. But getting him to sit down for an interview—that’s tough. I caught him on the road as he drove from his home in Taos to Washington State, where he was scheduled to catch a flight to Alaska to make his 21st ascent of Denali/Mt. McKinley, at 20,000 feet, the highest peak in North America. Hahn spends much of his time on Mount Rainier, a technical but approachable 14,000-foot peak in Washington that he’s topped more than 270 times. He can also be found on mountains in Antarctica, Argentina, and the Alps. 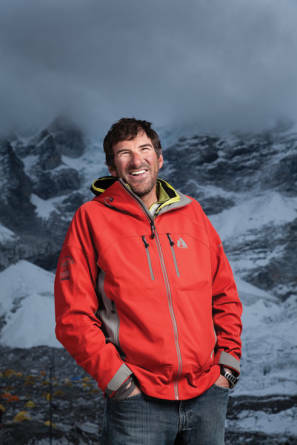 It’s Hahn’s record-breaking assault on Mount Everest that commands the most attention, though. He’s reached the top of the world’s tallest mountain more times than any non-Sherpa—15 successful summits. The numbers don’t tell the whole story. In an expedition documented by PBS, Hahn helped find the body of English mountaineer George Mallory, who’d gone missing on Everest in 1924. In 2004, he retraced Shackleton’s legendary traverse of South Georgia Island in Antarctica. “I’ve actually attempted the Shackleton Traverse seven times and succeeded five times,” Hahn says. (Nobody’s perfect.) He guides an exclusive clientele for Rainier Mountaineering and climbs with elite colleagues on Eddie Bauer’s First Ascent Team. In 2009, Men’s Journal magazine named Hahn the guide of the year. Spend a little time with him, and it’s easy to tell why. Hahn, 52, has a gentle, easygoing nature that makes him seem as much camp counselor as world-class athlete. He has a dark tan, naturally, and a youthful mien; there’s little gray in the beard he often sports. His experience is most obvious on a trail. Despite a more than six-foot frame, Hahn moves nimbly and confidently. He rarely takes time off, and maintains his conditioning throughout the year. Post-grad, Hahn first found work at Angel Fire as a ski instructor, quickly moved on to Taos, and switched to patrolling in 1991. Hahn devotes the summer to Washington and Alaska. Everest takes up most of the spring. He also makes time to work in Antarctica during the North American winter on Mount Vinson, a 16,000-footer. He spends his short “off-season” as a ski patroller in Taos, to stay fit. Patrolling keeps him at altitude, exposed to the cold and conditions. “My house is at 7,500 feet, our ski patrol headquarters are at 11,819 feet, and it’s pretty typical on a normal day to hike up to Kachina Peak, at 12,481 feet. I just generally try to stay outside and do my job,” says Hahn. The state’s mountaineering scene has expanded since, but not too much. “I like that climbing and mountaineering are not so foreign to New Mexico anymore, but it’s not as mainstream as in Colorado or Utah. There’s not that feeling that you have to fight the crowds,” he says.